American Wellness Solutions, LLC celebrates second anniversary. September 9, 2015 – Portsmouth, NH – American Wellness Solutions, LLC, New Hampshire’s premier provider of worksite wellness consulting services, celebrates its second anniversary of helping people and organizations in the greater Portsmouth area increase their wellness. American Wellness Solutions helps companies either create new employee wellness programs or enhance existing ones. McCue, a veteran wellness coach, applies a coaching approach when working with organizations. “I don’t offer canned programs. That’s like a doctor prescribing the exact same medication for every patient, regardless of their condition.” Instead, McCue says he prefers to help an organization discover which solutions will work best for them. To celebrate American Wellness Solutions’ second anniversary, McCue is offering new corporate clients two complimentary hours of professional chair massage for their employees. New individual clients can find a $50 coupon in the current Seacoast Savings Magazine. American Wellness Solutions, LLC offers mindfulness classes for employees. August 10, 2015 – Portsmouth, NH – American Wellness Solutions, LLC, New Hampshire’s premier provider of worksite wellness consulting services, now offers mindfulness meditation training for employees. Meditation has been practiced for thousands of years and in many different cultures. Often it is associated with religious practices. Mindfulness is a specific type of meditation and was developed as a secular, medically-based intervention to help people facing various health challenges. This form is not affiliated with any religion or spiritual tradition. Mindfulness involves training the mind to focus on the experience of the present moment without judgment. When practiced consistently over time, research has shown mindfulness meditation may help reduce stress, chronic pain issues (and therefore decreased dependence on pain medications), insomnia, high blood pressure, heart disease, asthma, anxiety, rumination, panic attacks, depression and fatigue. It may also help improve quality of sleep, problem solving ability, immune function, creativity, self-esteem and the ability to cope with stressful situations. In addition to the real intrinsic benefits mindfulness meditation can offer employees to help increase their quality of life, it can also help a company’s bottom line. Almost every single health and wellness issue can increase health care utilization as well as decrease an employee’s productivity through a combination of absenteeism and presenteeism. By reducing the deleterious effect of these issues through mindfulness meditation, productivity can increase and health care expenses can go down. Wellness in New Hampshire is declining and it is costing businesses plenty. March, 2015 – Portsmouth, NH – Since 2008, Gallup, a national opinion research company, and Healthways, a global well-being solutions provider, have interviewed people from all over the United States about their wellness and the results are published as the annual Well-Being Index (WBI). Last month Gallup-Healthways released their 2014 State Well-Being Rankings. Although the full State of American Well-Being for 2014 hasn’t been published yet, they have listed the composite wellness scores of the 50 states and it is not looking good for New Hampshire. Through 2013, the people surveyed were asked to respond in six general areas: Life Evaluation, Emotional Health, Work Environment, Physical Health, Healthy Behaviors and Basic Access. The scores in each of these areas were then combined to produce a composite total for that state. In 2008, New Hampshire’s overall well-being score placed us 16th in the country. In 2009 and 2010, we got to 14th and 15th place respectively. 2011 saw us at #11 and in 2012 we peaked as the 8th state in the country with the highest well-being score. In 2013, we slipped back into the 2nd quintile at number 11. Although this may not seem that bad, the internals tell a different story. Between 2011 and 2013, we made gains in some areas. Most notably, we went from 23rd to 14th in Life Evaluation and from 28th to 12th in Emotional Health. 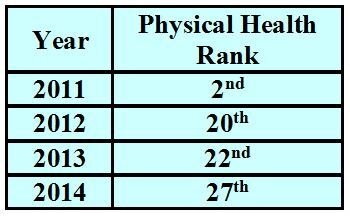 In that same time frame however, we dropped from 2nd place to 18th in Healthy Behaviors and as a logical consequence of that, we fell twenty spots from 2nd to 22nd in the area of Physical Health. Clearly something is going on and it isn’t good. The 2014 WBI composite rankings hold potentially more bad news for the Granite State. We have dropped yet again and we are now behind all three border states. Vermont, Maine and Massachusetts come in at 13th, 15th and 17th place respectively. New Hampshire is now 21st in the country. Although this certainly isn’t good news, it may not be that bad. We won’t know until the full report is published. The issue at hand is that last year Gallup-Healthways changed the wellness areas in which people were surveyed. There are now only five areas instead of six and they are: Purpose, Social, Financial, Community and Physical. This may be an attempt to become more congruent with the six dimensions of wellness model promoted by organizations such as the National Wellness Institute. The fact remains however that regardless of this change, we now find ourselves in 21st place. The internals of our latest composite score breakdown as follows: For Purpose, we come in at 36th. Social & Financial have us in 18th and 24th place respectively. We score highest in Community putting us in 11th place and for Physical we are in the bottom half at 27th place. I find the first and last areas to be the most troubling. Gallup-Healthways defines Purpose as “Liking what you do each day and being motivated to achieve your goals.” and Physical is “Having good health and enough energy to get things done daily.” Juxtaposing the low scores in these two areas, it could be inferred that the direction we are headed is unsustainable. The trend in Physical Wellness, going from 2nd place to 27th in four years, also presents an expensive challenge to New Hampshire businesses through increased costs and decreased productivity. Conversely, businesses that actively seek to address and reverse this trend can not only strengthen their bottom line and competitive advantage but also, and perhaps more importantly, help their employees lead richer, more fulfilling and possibly even longer lives. This is demonstrated by research conducted over the past several years which shows that well designed worksite wellness programs can yield an average return on investment of over 300%. The bulk of these gains are realized through lower healthcare utilization, decreased absenteeism and decreased presenteeism (reduced productivity due to health issues). Right now, about 35% of Americans are considered obese. So in a company with 150 employees, around 52 of them will be dealing with this condition. A typical business pays an extra $1,350 per employee per year in excess medical costs for obesity. So right off the bat, they’re paying an extra $70,200. Absenteeism due to obesity is estimated to cost businesses about 1.4% (PEPY) in lost productivity. Assuming the average compensation for the 150 employees in our sample company is $45,000 per year, obesity-related absenteeism will cost them another $32,750 annually. Obesity-related presenteeism can result in an additional 8.3% (PEPY) reduction in employee output. In our example, this comes out to $194,200 in indirect costs. This one condition adds close to $300,000 annually to our sample company’s budget. Other conditions such as depression, diabetes, hypertension, high cholesterol, migraines, tobacco use, physical inactivity, etc. can also negatively impact a company’s health. American Wellness Solutions, LLC launches Worksite Wellness Survey. November 19, 2014 – Portsmouth, NH – American Wellness Solutions, LLC, New Hampshire’s premier provider of worksite wellness consulting services, introduced a new Worksite Wellness Survey. The survey, which quantifies important worksite wellness metrics, establishes a baseline for several measurements at the start of a new wellness initiative as well as provides the means for evaluating the ongoing success of wellness initiatives as they evolve. Fast becoming an indispensable component of work life, worksite wellness programs enhance the overall wellbeing of employees and other stakeholders and can play a significant role in organization’s bottom line. Research supports an overall return on investment: one meta-analysis conducted by Harvard University researchers concluded a return on investment of 327% in reduced medical costs and 273% in reduced absenteeism. Many other studies depict similar results. “Three of the most important aspects of any worksite wellness effort that need to be addressed are individual wellness & risk stratification, the organization's culture and presenteeism”, explained Joe McCue, owner. “A recently identified driver of reduced productivity, presenteeism (a play on the word ‘absenteeism’) is costing businesses millions of dollars every year and most people have never heard of it. It occurs when an employee shows up for work but due to one or more factors adversely affecting their wellness, they are incapable of optimal productivity.” The survey is designed to quantitatively measure all three aspects. Quantifying the problem is the first step towards finding and implementing effective solutions and the insights gained from the survey are crucial for companies trying to decide how best to invest their worksite wellness budget in order to maximize return on investment. The survey itself can be completed in about ten minutes. It is also completely confidential and HIPAA compliant as no personally identifiable information is required or requested of any individual taking the survey. All collected data is reported in the aggregate.